When done right, grilling can be one of the more healthful ways to prepare food. Preparing meats and poultry on the grill allows excess fat to drip away. Very little fat needs to be added to foods cooked on the grill. Grab those tongs, it’s time to grill! Picnics, get-togethers and tailgating are a great time to hang out, enjoy the weather and grill some delicious food. Following the safety tips in this handout will help ensure that your family and friends have a safe and enjoyable experience as well. Place beverages in one cooler and perishable food in another. Refrain from opening the cooler as much as possible. Keep the cooler in an air conditioned part of the car, not in the hot trunk. Keep meats wrapped and sealed to avoid cross-contamination. At the grocery store, wait until right before you check out to pick out your cold items such as meat and poultry. Be sure to separate meat and poultry from the other items in your cart, especially fresh fruits and vegetables. Use the plastic bags provided in the meat and produce sections to help prevent cross-contamination, which can happen when raw meat drips onto other foods. Make the grocery store the last stop if possible. Keep all cold foods together, or bring a cooler to transport cold items. Perishable food should be refrigerated within two hours. Place meat and poultry in the refrigerator immediately. Store raw meat in a container on the lowest shelf so it won’t drip onto other food. If you don’t plan to use the meat soon, freeze it. Not preparing the meat or poultry immediately? Keep cold foods below 40 F.
Keep frozen foods below 0 F.
Clean hands and clean preparation surfaces are the start to safe grilling. Wash your hands with warm, soapy water for 20 seconds before preparing or handling food. Clean any food contact areas before, during and after food preparation. Don’t forget to wash fresh fruits and vegetables, even those with peels and rinds, before preparing them. Raw meat and poultry should be prepared separately from fruit, vegetables and cooked foods. When you cut up meats and vegetables, be sure to use different cutting boards and knives (or wash thoroughly with soap and warm water in between uses). Discard worn-out cutting boards. To prevent foodborne illness, don’t use the same plate/tray and utensils for raw and cooked meat/poultry. Use the refrigerator or thaw sealed packages in cold water. If the meat is going right on the grill, you can use the microwave to defrost. Be sure meat is fully thawed before placing it on the grill. Marinate meat in the refrigerator, not on the counter. Poultry and cubed meat can marinate safely for two days. Beef, veal and pork roasts, chops and steaks can be marinated for up to five days. If you want to use some of the marinade for sauce after the meat is cooked, reserve some before you put the meat in it. Avoid flareups when grilling by using lean meats and trimming excess fat off the meat. Be sure to keep a spray bottle of water nearby just in case a flareup occurs. Using the microwave, oven or stove can be a good way to reduce grilling time. Just make sure the meat goes immediately onto the preheated grill. Grills need annual deep cleaning. A leaf blower and garden hose work great to get started. Then scour the grate with a wire brush to remove debris. Clean the grill each time you use it. Use nonstick cooking spray before each use to prevent food from sticking to the grill. How Hot Is the Grill? A good way to estimate the temperature of your grill is to place your hand, palm side down, about 4 inches above the coals. Count how many seconds you can leave your hand there before you have to pull away. Use long-handled tongs and flame-retardant mitts to protect your hands. Pick a safe area: Place the grill on a well-ventilated, flat, level surface away from overhangs, deck railings and shrubbery. Handle charcoal safely; never add lighter fluid directly to hot coals. 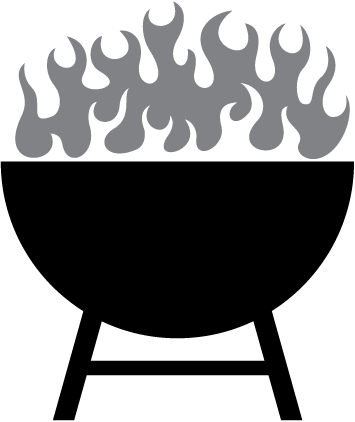 Putting out the fire: Cover the grill and close the vents, allow the coals to cool completely for at least 48 hours and dispose of them in a noncombustible container. Keep a bucket of water and/or a fire extinguisher close at hand. Keep children and pets away from hot grills and coals. Is It Done Yet? Don’t Count on Color! Cooking food to the minimum internal temperature can reduce the risk of foodborne illness greatly. Use a thermometer and the chart below to ensure the food has reached a safe temperature. Never partially grill meat or poultry and finish cooking later. Meat and poultry cooked on the grill often browns quickly on the outside and may not be done on the inside. Is Charred Meat Linked to Cancer? Meats that are fried or grilled, especially when cooked until extremely well-done or charred, contain the highest levels of HAA (heterocyclic aromatic amines). HAA are potentially carcinogenic. Polycyclic aromatic hydrocarbons (PAHS) form when fat drips on charcoal or hot stones, causing flare-ups and smoke formation. PAHS also are linked to increased cancer risk. Turn food frequently. Flipping meat often lessens the formation of HAA. Cook smaller portions of meat, such as kabobs, to reduce the amount of time the meat spends on the grill. Source: American Institute for Cancer Research. When you take food off the grill, be sure to use clean utensils and place the food on a clean platter. Juices left on the plate from the raw meat can cross-contaminate the cooked meat. In hot weather (above 90 F), food never should sit out for more than one hour. Use shallow containers to speed up cool down. Discard any food left out for more than two hours (one hour if temperatures are above 90 F).